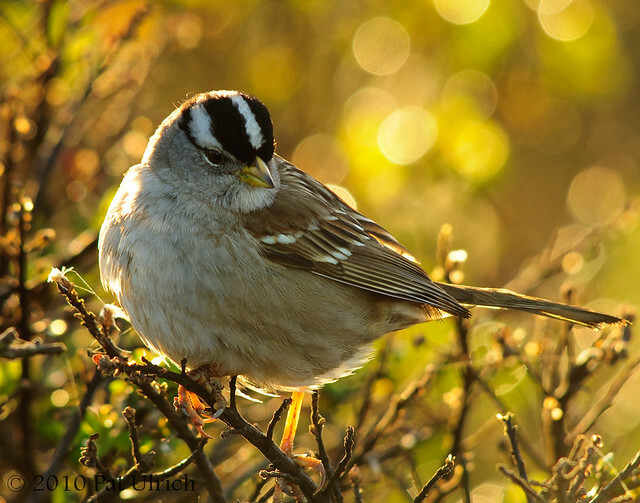 A white-crowned sparrow backlit with morning light along Limantour Spit in Point Reyes National Seashore. A fine image. Nice bokeh and the backlighting adds to feather detail. Thanks for sharing! Thank you for your fine photography Pat. It is a great joy to be able to enjoy your view of the west coast with the simple click of a mouse button. Engaging images like this one of the White crowned Sparrow certainly inspire us to get out of our chairs and get a look at this world! Thanks, John! I'm glad you enjoyed this image! Thanks, Springman! It is amazing how easily we can hop from one location to the next on the internet. Sure its not the same as actually visiting a place, but its really cool to get to see what is there.